Ya know I love sharing with you where am I at on my fitness journey, what am I doing, changing, macros, recipes and everything! I’m not an expert, and I still consider myself pretty new on the fitness industry, and as an instructor. I feel confident enough to create and program classes, but I love to learn and experiment with different types of training and fitness styles. These fitness updates have been helping me to keep you in the loop, and to share what I have learnt and how my body has reacted to it. With all that being said, my meals and training might change sometimes, and my “progress” might look slower than others, and it is just because many reasons, some have to do with my nutrition, the fact that I have a very fast metabolism and my body doesn’t build muscle as easier as I thought. But also that I’m not taking any supplements or crazy diets. Last time I shared my update, I was feeling frustrated because I wasn’t seeing changes, and it was very hard to hit my macros. I’ve been eating on a surplus (eating more than my maintenance calories) for 3 months, we have changed them a few times, and some days it feels like it is way too much food. As I said, my health comes first, and I rather don’t hit my macros and feel good, than forced myself to eat more. 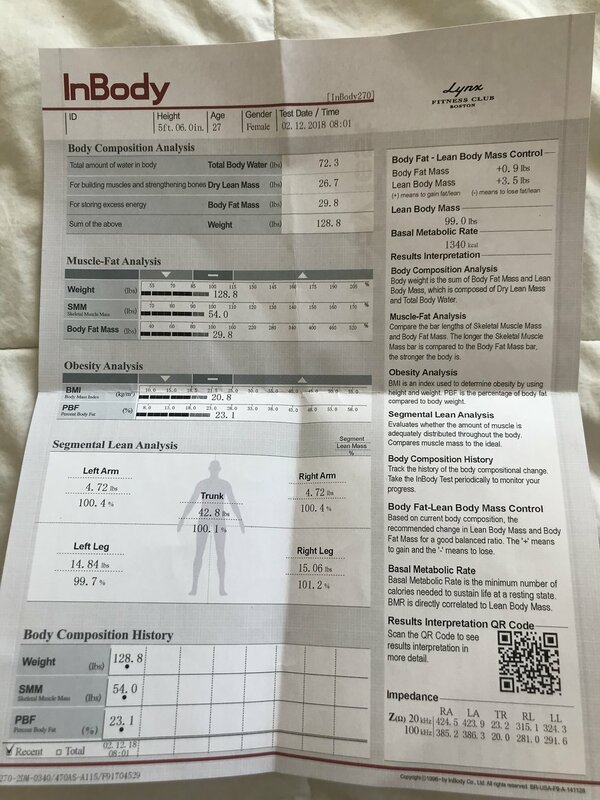 However, during that month I did an “In Body Test” to track my progress on a different way. I could see where my fat % was, my muscle mass and more. It was super helpful to keep myself motivated, but also to get over that frustration stage. 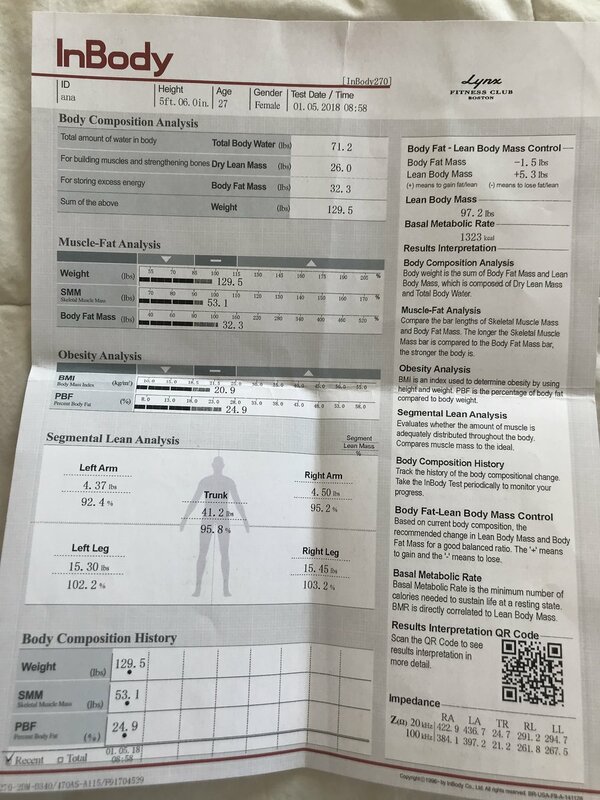 I was able to build 1lb of muscle mass, and shred 2 lbs of body fat. I was super loose on my eating to be honest, so the changes are as a surprise. The past couple weeks have been a bit of a free workout style for me, I took a few days to do nothing, just walk, and others to create my own workouts, and some others to take fitness classes or do BBG. This week I sat down with a Nutritionist and Personal Trainer friend, and went over some goals, how I was feeling and what is next. We spoke about the importance to listen to our bodies, and how can we implement macro tracking and see results. The most important part, how to make it healthy and sustainable! I have also spoke to Matt (my partner) into getting back into working out together. Two years ago we did BBG for 3 months together and we loved it. It was a great way to challenge ourselves, have an accountably partner, but also do something we both love, well…kinda. We never liked the push ups and jump squats or burpees to be honest. But who does! But we do love staying active, and after years together, we have found that short workouts (very intense ones) are one thing we enjoy doing together. Putting all this together, along some other plans we have, I have decided to continue lifting but adding some BBG sessions with Matt. I don’t have an specific plan yet, I just know that I love both and I will make it work, without over training. Ideally I will do 2-3 lower body sessions a week, 2 upper-body days, 1 full body circuit, and 1 rest days. Along that, I do very very very gentle yoga, and foam rolling sessions. I will test out how this goes, and I will let you know on the next update! Before I let you go, heres a quick MACRO UPDATE. I’m tracking but I’m not obsessed about it. I use mymacros+ app, where I track all my meals, and I’m using the notes app to write how I feel everyday, if I was satisfied or I needed more food. I’m tracking to better understand my body, but again, not crazy about it. DON'T FORGET, this is MY fitness journey, and it might look super different to yours. I choose routines that I truly love, and that fit into my lifestyle. Maybe if I was single I would purely do one thing, but my partner is also part of my life, so I prioritize our relationship, and it is something we both love doing. So why not! - To me looking good or having XYZ isn't a priority, I rather feel good, knowing that the workouts are doing are fun, and that help my bones and muscles get stronger and my body healthy. Thank you for reading, AND I hope find this helpful.